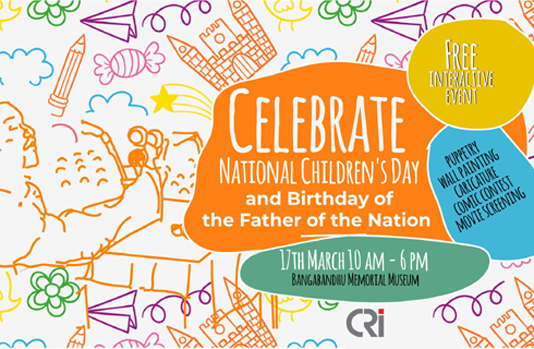 Ruling Awami League’s research wing Centre for Research and Information (CRI) is celebrating the 100th birthday of Father of the Nation Bangabandhu Sheikh Mujibur Rahman and National Children’s Day amid different programmes joined by a large section of children. “We have been arranging different programmes including a comic competition for children and a photo exhibition, puppet show on life and works of Bangabandhu on the premises of Bangabandhu Museum since morning,” CRI executive director Sabbir Bin Sams told BSS today. He said a large number of children joined the comic competition which started at 11 am while the photo exhibition also drew a huge crowd who came to pay homage to Bangabandhu, the architect of independent Bangladesh, at his portrait in front of the Bangabandhu Museum at Dhanmondi road number 32 here. Besides, “Hasina: A Daughter’s Tale”, a historical docudrama directed by Piplu Khan on the life of Prime Minister Sheikh Hasina, daughter of Bangabandhu, will be screened as special show at Bangabandhu Memorial Museum at Dhanmondi at 2pm and 4pm today under supervision of CRI, he added.